S couplers -- built-in check valve. SMC Pneumatics has expanded its range of S couplers with the addition of the stainless steel KKA Series, suitable for handling both air and water. Unique to this range is a built-in check valve which is available on both the plug and socket to prevent dripping, spillage and unnecessary mess when uncoupled. The design of the check valve also minimises the possibility of aeration of the liquid when reassembled. No grease is used in the manufacture or assembly of the new series. Instead, all sliding parts on the new models are fluorine coated to ensure smooth connection and disconnection, reuseability and long life. Plug and socket fit together in a simple, push-in arrangement for quick and easy assembly in a range of applications using fluid processes such as food and pharmaceutical manufacturing. The KKA Series is available in five port sizes ranging from 1/8" to 3/4" in both male and female thread types, with or without check valves fitted. Three body types are available depending on the port size required. 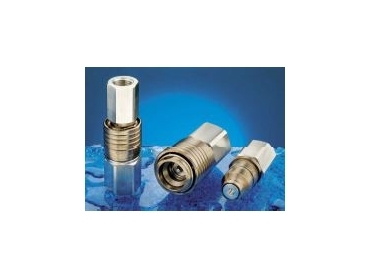 KKA Series couplers are suitable for use in temperatures ranging from -5ºC to 100ºC at operating pressures of -100kPa to 1MPa.